If you enjoy watching ballet & dance, you will LOVE seeing The Asaph Dance Ensemble in action. The Ensemble is a non-profit professional ballet company, and each year they perform their own ballet using the Nutcracker music. It is absolutely spectacular! If you are in the Metropolitan DC area, you won’t want to miss this year’s Christmas Concert at the NVCC Alexandria campus in the Schlesinger Concert Hall on December 13th at 4:00 p.m.! Tickets are only $15 adults, or $10 for children under 12 and senior citizens. Contact The Asaph Dance Ensemble for details (see address below). Since our children have been part of Clara’s Christmas for several years (through association with the Northern Virginia Dance Academy), we have had the opportunity to photograph the dance, and this year, Carol used some of our photographs to make a calendar keepsake! The proceeds will benefit this worthy ministry. 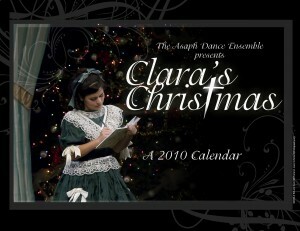 This exquisite 2010 Clara’s Christmas Calendar Keepsake featuring stunning photographs of the Asaph Dance Ensemble’s 2008 performance of Clara’s Christmas is on sale NOW through November 27th, 2009 at only $13 each! Please make checks payable to Asaph Dance Ensemble and enclose it in an envelope and leave it in the Tuition Box at the NVDA Studio or mail to: 8797 Commerce Court, Manassas, VA 20110-5235. For more information about either the calendar or the performance, call 703-368-1812 or go to www.asaphensemble.org. Carol, I would love to order three of the calendars, but won’t be at the studio until the 28th. May I write the check then? I know the order forms have been sitting there, but I missed the actual deadline information. Sorry to complicate things! Hope you had a lovely Thanksgiving! See you tomorrow.